An Australian soldier firing a Vickers .303 machine gun on Turkish positions. 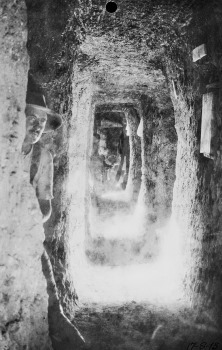 Lit by sunlight through the observation hole at right, the post one of many in the extensive array of tunnels connecting the Australian front line positions. War at Gallipoli was not just waged above ground, but also underground. From May 1915, both sides engaged in mining around posts held by Anzac troops on Second Ridge and at the Nek. The mine warfare at Quinn’s Post began with listening tunnels. When the Anzacs realised that the Ottomans were tunnelling towards the post, several enemy shafts were destroyed. However, they missed one and it was exploded near part of Quinn’s Post. 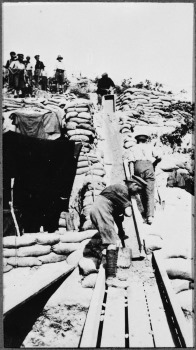 After the ensuing fighting subsided, a major effort was made to build a protective apron of tunnels in front of Quinn’s Post. Pte. Vic Nicholson describes action at Quinn's Post. "Most of the garrison at any time in Quinn's Post got mixed up in the mining in the mining galleries. That was constituting and making the galleries, and it was left over a lot to the infantryman, who could work when he was off duty at night. And it didn't matter very much whether it was night or day because it was always night down there. And the galleries ran from our line out as near as we could get to under the Turkish line. And to be pushed along one of those galleries on the working face and chipping away with the little entrenching tool, and filling a sandbag, scraping the spoil into a sandbag and passing it back against a line of other blokes who were filling up the tunnel was not very bright. It was more of a frightening experience than anything else, especially if you did happen to hear." Mining was hard work. ‘We knew our jobs and worked like Trojans,’ wrote Australian Corporal Hedley Howe, who was in a mining gang at Quinn’s Post. ‘Each gang was expected to drive twelve feet (about 4 metres) in an eight-hour shift... It was the hardest labour on the peninsula.’ The tunnels were often tiny – only about 2 metres high and less than a metre wide. The men had to dig them by hand, as explosives were not permitted. Pte Vic Nicholson, 1999-2999-1A, National Army Museum, NZ.